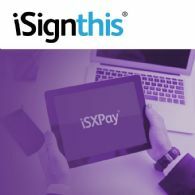 iSignthis Ltd (ASX:ISX) (FRA:TA8) following its announcement dated 6th February 2019, is pleased to announce that it has received a number of applications from Australian domiciled merchants for ISXPay&apos;s transactional banking capabilities. iSignthis Ltd (ASX:ISX) (FRA:TA8) is a leading business focused neobank, with payments, eMoney, deposit taking and identity capabilities, publicly listed on the Australian Securities and Frankfurt Stock Exchange. iSignthis Ltd (ASX:ISX) (FRA:TA8) is pleased to announce that it has received communications from its auditors Grant Thornton Australia Ltd and its IT Security Auditors, Security Centric Pty Ltd, regarding the use of the Probanx Coreplus core banking platform in Australia to satisfy its ADI operations and APRA requirements. 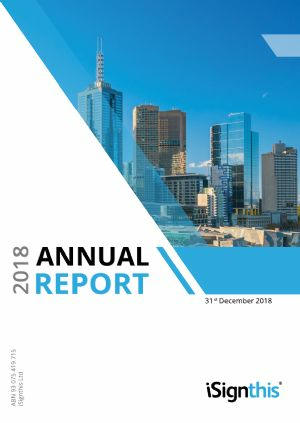 Australian Securities and Frankfurt Stock Exchange cross listed iSignthis Ltd (ASX:ISX) (FRA:TA8), the global leader in RegTech for identity verification and transactional banking/payments, is pleased to provide the following business update and un-audited Appendix 4C for the quarter ended 31st December 2018.
iSignthis Ltd (ASX:ISX) (FRA:TA8) is pleased to announce that it has been advised by the Korean Patent Office of a notice of acceptance of its patent application titled "Methods and Systems for Verifying Transactions". The notice will move to grant of letters patent in accordance with the standard Korean practice. iSignthis Ltd (ASX:ISX) subsidiary, iSignthis eMoney Ltd, trading as ISXPay(R) ("the Company"), is pleased to announce its first merchant has gone live on its own integrated and unified neobanking platform comprising principal acquiring platform for Visa, Mastercard and JCB. Brussels, 5th December 2018: iSignthis Ltd (ASX:ISX) subsidiary, iSignthis eMoney Ltd, trading as ISXPay(R) ("the Company"), is pleased to announce it has accepted deposits on behalf of customers to its own issued International Bank Account Numbers (IBANs). iSignthis Ltd (ASX:ISX) provides the Company&apos;s AGM Presentation. 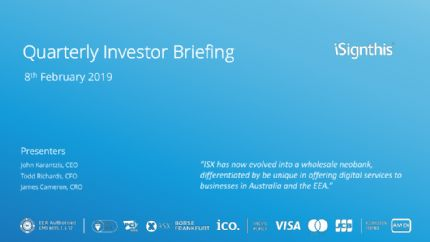 Australian Securities Exchange and Frankfurt Stock Exchange cross listed iSignthis Ltd (ASX:ISX) (FRA:TA8), is pleased to announce that it has completed its Tier 1 integration to access both Visa and Mastercard directly, per its previously announced timetable on 30th August. Australian Securities Exchange and Frankfurt Stock Exchange cross listed iSignthis Ltd (ASX:ISX) (FRA:TA8), is pleased to announce that it has executed an eCommerce Acquiring Business agreement with Diners Club International Ltd.
iSignthis Ltd (ASX:ISX) subsidiary, iSignthis eMoney Ltd, trading as ISXPay(R), is pleased to announce that testing of its deposit taking facilities and software systems has been completed. The resultant International Bank Account Number accounts will shortly be online and IBAN accounts will be interbank network locatable via ISXPay&apos;s SWIFT / Bank Institution Code ISEMCY22XXX. 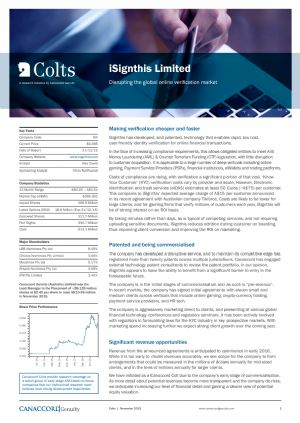 Australian Securities and Frankfurt Stock Exchange cross listed iSignthis Ltd (ASX:ISX) (FRA:TA8), the global leader in RegTech for identity verification and transactional banking/payments, is pleased to provide the following business update and Appendix 4C for the quarter ended 30th September 2018.
iSignthis Ltd (ASX:ISX) is pleased to announce that its JCB card acquiring service is now operationally live, with our first two (2) merchants accepting JCB cards commencing transactions imminently. iSignthis Ltd (ASX:ISX) is pleased to announce that its wholly owned subsidiary, Probanx Information Systems Ltd has completed integration with Wanfuteng Bank (www.wanfutengbank.com). iSignthis Ltd (ASX:ISX) advises that it has resolved its supply chain issues associated with its settlement bank. 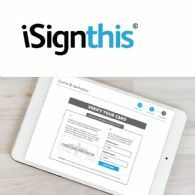 iSignthis Ltd (ASX:ISX) (FRA:TA8) is pleased to advise that its wholly owned subsidiary, iSignthis eMoney (AU) Pty Ltd has entered into a card not present / online agreement with Union Pay International, to act as a card acquirer of China Union Pay issued cards. iSignthis Ltd (ASX:ISX) (FRA:TA8) is pleased to advise that it has successfully secured a placement of 68,965,517 ordinary shares in the Company to a number of sophisticated and wholesale investors at a price of A$0.145 per share, raising A$10m before costs. iSignthis Ltd (ASX:ISX) provides an update regarding its third party supply chain. iSignthis Ltd (ASX:ISX) (FRA:TA8) provides the Company&apos;s Investor Briefing presentation. iSignthis Ltd (ASX:ISX) provides the Company&apos;s Annual Report to shareholders. Australian Securities and Frankfurt Stock Exchange cross listed iSignthis Ltd (ASX:ISX) (FRA:TA8), the leading payment and identity technology company, is pleased to announce that it has signed an agreement with Prasos, Finland&apos;s largest cryptocurrency service provider, for the provision of payment processing and identity verification services. Australian Securities Exchange and Frankfurt Stock Exchange cross listed iSignthis Ltd (ASX:ISX) (FRA:TA8), the leading payment and identity technology company, is pleased to announce that it has completed acquisition of 100% of the issued capital of Cyprus based, Probanx Information Systems Ltd.
Australian Securities Exchange and Frankfurt Stock Exchange cross listed iSignthis Ltd (ASX:ISX) (FRA:TA8) is pleased to announce that it has entered into terms to acquire 100% of the issued capital of an EU based core banking platform software business. 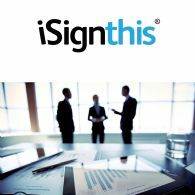 Australian Securities Exchange and Frankfurt Stock Exchange cross listed iSignthis Ltd (ASX:ISX) (FRA:TA8), is pleased to announce that it has contracted a major merchant in the MCC 6211 category (equities/brokers/market makers/FX/CFD), in Australia. Australian Securities Exchange and Frankfurt Stock Exchange cross listed iSignthis Ltd (ASX:ISX) (FRA:TA8), the deposit taking EEA authorised monetary financial institution with transactional banking capability, is pleased to announce that it is now a scheme member of the European Payments Council Single Euro Payment Area Scheme. 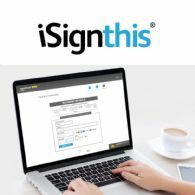 Australian Securities Exchange and Frankfurt Stock Exchange cross listed iSignthis Ltd (ASX:ISX) (FRA:TA8), the leading payment and identity technology company, is pleased to announce it has achieved certification for its JCB Card acquiring service across the European Economic Area. iSignthis Ltd (ASX:ISX) (FRA:TA8) provides the Company&apos;s latest presentation titled "Analyst Brief - Online Interactive Session". Australian Securities and Frankfurt Stock Exchange cross listed iSignthis Ltd (ASX:ISX) (FRA:TA8), the global leader in RegTech for identity verification and transactional banking/payments, is pleased to provide the following business update and Appendix 4C for the quarter ended 30th June 2018. Australian Securities and Frankfurt Stock Exchange cross listed iSignthis Ltd (ASX:ISX) (FRA:TA8), the world leading RegTech for identity verification and payment services, is pleased to announce that its Australian subsidiary, iSignthis eMoney (AU) Pty Ltd, has executed a Principal Membership agreement with Mastercard International Inc, for the Australian region. iSignthis Ltd (ASX:ISX) (FRA:TA8) is pleased to announce the appointment of Mr. Christakis Taoushanis as a non-executive director. Taoushanis has since 10th April 2017 served as Chairman of the Board of iSignthis eMoney Limited, the Company&apos;s 100% owned subsidiary incorporated in the Republic of Cyprus. 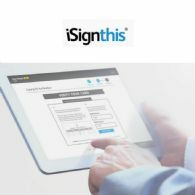 Australian Securities Exchange and Frankfurt Stock Exchange cross listed iSignthis Ltd (ASX:ISX) (FRA:TA8), the world leading RegTech for identity verification and payment services, is pleased to advise that cash receipts for Half Two are now in excess of Three Million Seven Hundred and Fifty Dollars ($3,750,000). Australian Securities Exchange and Frankfurt Stock Exchange cross listed iSignthis Ltd (ASX:ISX) (FRA:TA8), the world leading RegTech for identity verification and payment services, is pleased to announce that it is now a SWIFT usership member, with a SWIFT locatable BIC of ISEMCY22, post integration. Australian Securities Exchange and Frankfurt Stock Exchange cross listed iSignthis Ltd (ASX:ISX) (FRA:TA8), the world leading RegTech for identity verification and payment services, is pleased to announce that it has signed an agreement with an artificial intelligence fintech bill payment automation startup called Gobbill(TM). Australian Securities and Frankfurt Stock Exchange cross listed iSignthis Ltd (ASX:ISX) (FRA:TA8), the global leader in RegTech for identity verification and transactional banking/payments, is pleased to provide the following business update. Australian Securities and Frankfurt Stock Exchange cross listed iSignthis Ltd (ASX:ISX) (FRA:TA8), the global leader in RegTech for identity verification and transactional banking/payments, is pleased to provide the following business update and Appendix 4C for the quarter ended 31st March 2018.
iSignthis Ltd (ASX:ISX) (FRA:TA8), the world leading RegTech for identity verification and payment services, is pleased to announce that the Company has applied to the Australian Securities and Investment Commission to change its financial year from the Australian standard 1st July to 30th June to the European position of reporting on a calendar year basis. Australian Securities Exchange and Frankfurt Stock Exchange cross list iSignthis Ltd (ASX:ISX) (FRA:TA8), the world leading RegTech for identity verification and payment services, is pleased to announce that it&apos;s Australian subsidiary, iSignthis eMoney (AU) Pty Ltd, has executed a payment aggregation agreement with American Express Australia. Australian Securities Exchange and Frankfurt Stock Exchange cross listed iSignthis Ltd (ASX:ISX) (FRA:TA8), the world leading RegTech for identity verification and payment services, is pleased to announce that it has extended the scope of its Paydentity solution to XM.com to include provision of Chinese identity verification services, as a standalone service. Australian Securities Exchange and Frankfurt Stock Exchange cross listed iSignthis Ltd (ASX:ISX) (FRA:TA8), the world leading RegTech for identity verification and payment services, is pleased to provide an update on its European operations. 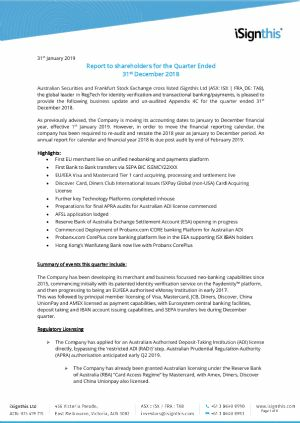 Australian Securities and Frankfurt Stock Exchange cross listed iSignthis Ltd (ASX:ISX) (FRA:TA8), the global leader in RegTech for identity verification and transactional banking/payments, is pleased to provide the following update for the half year ended 31st December 2017. Australian Securities Exchange and Frankfurt Stock Exchange cross listed iSignthis Ltd (ASX:ISX) (FRA:TA8), the world leading RegTech for identity verification and payment services, is pleased to announce it has contracted four major EU based settlement merchants, with an estimated annual Gross Processing Turnover Value book value in excess of EUR200m (+A$310m). Australian Securities Exchange and Frankfurt Stock Exchange cross listed iSignthis Ltd (ASX:ISX) (FRA:TA8), the world leading RegTech for identity verification and payment services, is pleased to announce interim operating update for its Australian payment processing and settlement operations. Australian Securities and Frankfurt Stock Exchange cross listed iSignthis Ltd (ASX:ISX) (FRA:TA8), the global leader in RegTech for identity verification and transactional banking/payments, is pleased to provide the following business update and Appendix 4C for the quarter ended 31st December 2017. Australian Securities and Frankfurt Stock Exchange listed iSignthis Ltd (ASX:ISX) (FRA:TA8) is pleased to announce that its subsidiary iSignthis eMoney Ltd has completed technical integration with Worldline, allowing the parties to commence their partnership announced in July 2017. Australian Securities and Frankfurt Stock Exchange cross listed iSignthis Ltd (ASX:ISX) (FRA:TA8), the global leader in RegTech for identity verification and transactional banking/payments, is pleased to announce that it has completed integration of its services to Australian Securities and Investment Commission regulated OTCapital (www.OTCapital.com). iSignthis Ltd (ASX:ISX) (FRA:TA8), the world leading RegTech for identity verification and payment services, is pleased to announce that the Poli Payments service is now integrated with the ISXPay(R) and Paydentity(TM) platforms. iSignthis Ltd (ASX:ISX) (FRA:TA8), the world leading RegTech for identity verification and payment services, is pleased to announce the following trading update and guidance upgrade for the December quarter. iSignthis Ltd (ASX:ISX) (FRA:TA8), the world leading RegTech for identity verification and payment services, is pleased to announce that it has completed the integration of its services with UK Financial Conduct Authority regulated Valutrades, which offers CFD&apos;s and FX trading. Australian Securities Exchange and Frankfurt Stock Exchange cross listed iSignthis Ltd (ASX:ISX) (FRA:TA8), the world leading RegTech for identity verification and payment services, is pleased to announce that it has contracted further merchants to ISXPay Australia. Australian Securities and Frankfurt Stock Exchange cross listed iSignthis Ltd (ASX:ISX) (FRA:TA8), the global leader in RegTech for identity verification and transactional banking/payments, is pleased to announce that it has completed integration of its services to Australian Securities and Investment Commission regulated TraderQ. Australian Securities and Frankfurt Stock Exchange listed iSignthis Ltd (ASX:ISX) (FRA:TA8), the global leader in enhanced payments incorporating AML/CFT KYC Regtech compliance technology, is pleased to announce that it has placed up to Six point Five Million dollars (AUD$6.5million) to institutional and sophisticated investors. iSignthis Ltd (ASX:ISX) (FRA:TA8), the world leading RegTech for identity verification and payment services, is pleased to announce that it has contracted and commenced the integration of its services with Dialinvest International N.V.
iSignthis Ltd (ASX:ISX) provides the Company&apos;s latest Investor Presentation. Australian Securities and Frankfurt Stock Exchange cross listed iSignthis Ltd (ASX:ISX) (FRA:TA8), the global leader in RegTech for identity verification, is pleased to announce that it has executed an agreement to integrate its Paydentity(TM) UBO Service with Web Shield Ltd&apos;s InvestiGate platform. Australian Securities and Frankfurt Stock Exchange cross listed iSignthis Ltd (ASX:ISX) (FRA:TA8), the global leader in RegTech for identity verification and transactional banking/payments, is pleased to provide the following business update and Appendix 4C for the quarter ended 30th September 2017. Australian Securities and Frankfurt Stock Exchange cross listed iSignthis Ltd (ASX:ISX) (FRA:TA8), the global leader in RegTech for identity verification and transactional banking/payments, is pleased to announce that it has completed integration of its services to Australian Securities and Investment Commission regulated Tradefinancial (http://www.tradefinancial.com.au). 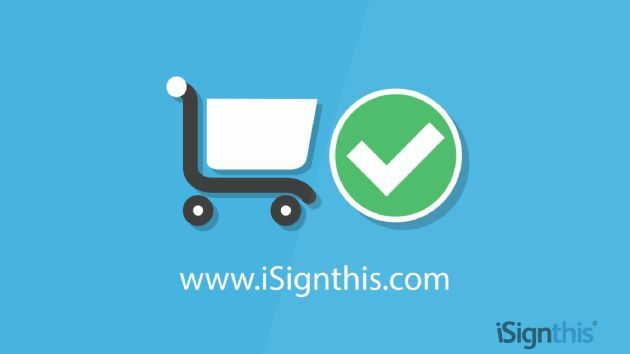 iSignthis Ltd (ASX:ISX) (FRA:TA8), the world leading RegTech for identity verification and payment services, is pleased to announce that it has completed integration of its services with cryptocurrency payment processor BuyCoinNow (www.buycoinnow.com) and that it is now processing live transactions via its Paydentity service and will contribute revenue in the current quarter. Australian Securities Exchange and Frankfurt Stock Exchange cross list iSignthis Ltd (ASX:ISX) (FRA:TA8), the world leading RegTech for identity verification and payment services, is pleased to announce that it has yesterday been advised by Visa Inc. of the acceptance as a Principal Member of its subsidiary iSignthis eMoney Ltd, trading as ISXPay(R). The directors present their report, together with the financial statements, on the consolidated entity consisting of iSignthis Ltd (ASX:ISX) and the entities it controlled at the end of, or during, the year ended 30 June 2017. Australian Securities Exchange and Frankfurt Stock Exchange cross list iSignthis Ltd (ASX:ISX) (FRA:TA8), the world leading RegTech for identity verification and payment services, is pleased to announce that it has commenced contracting merchants to ISXPay Australia. Australian Securities and Frankfurt Stock Exchange cross listed iSignthis Ltd (ASX:ISX) (FRA:TA8), the leading RegTech/KYC transactional banking technology provider, welcomes the announcement yesterday by The Minister for Justice, The Hon Michael Keenan, MP of a bill to strengthen Australia&apos;s money laundering laws, including bringing bitcoin providers under the remit of AUSTRAC. Australian Securities and Frankfurt Stock Exchange listed iSignthis Ltd (ASX:ISX) (FRA:TA8) is pleased to announce that its subsidiary iSignthis eMoney Ltd, is now a Principal Member of Mastercard Worldwide. iSignthis Ltd (ASX:ISX) provides the Company&apos;s Investor Presentation of June 2017 4C Quarterly Commentary. Australian Securities and Frankfurt Stock Exchange cross-listed iSignthis Ltd (ASX:ISX) (FRA:TA8) is pleased to provide the following business update and Appendix 4C for the quarter ended 30th June 2017. 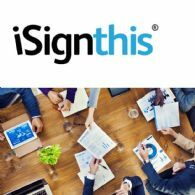 Australian Securities and Frankfurt Stock Exchange listed iSignthis Ltd (ASX:ISX) (FRA:TA8) is pleased to announce that its subsidiary iSignthis eMoney Ltd has entered into a partnership agreement with Worldline. JCB International Co., Ltd., the international operations subsidiary of JCB, is pleased to announce that Australian Securities and Frankfurt Stock Exchange listed iSignthis Ltd (ASX:ISX) (FRA:TA8), the global leader in remote identity verification, payment authentication and payment processing, has signed a direct License Agreement to process JCB transactions in the Single Euro Payments Area. iSignthis Ltd (ASX:ISX) (FRA:TA8) are pleased to announce that it has commercially deployed its PaydentityTM Console solution to Icelandic based European acquirer and issuer, Borgun. Australian Securities Exchange listed iSignthis Ltd (ASX:ISX) is pleased to announce that it has today cross listed on the Frankfurt Stock Exchange under the code "TA8". iSignthis Ltd (ASX:ISX) (&apos;the Company&apos;) is pleased to announce that its portfolio of granted patents has increased to 6 distinct types, 5 of which are directly related to Payment Instrument Verification (PIV). The Company has also filed for a further 4 new unique patents, which are related to identity, payments, security and customer pay-outs and are pending examination. iSignthis Ltd (ASX:ISX) [&apos;the Company&apos;] is pleased to announce that it has entered into an agreement with Pepperstone Group Limited, for Paydentity and Payment Gateway services, for the group&apos;s UK and Australian operations. 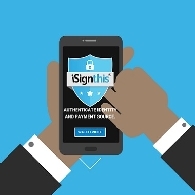 iSignthis Ltd (ASX:ISX) is pleased to announce that it has commercially deployed its Paydentity(TM) solution to XM.co.uk. The Paydentity(TM) service is now live on XM&apos;s UK licensed operations, and is initially accessible to UK and EU residents. iSignthis Ltd (ASX:ISX) is pleased to announce that it has entered into an agreement with foreign exchange business, Calforex and sister company GoInterpay. iSignthis Ltd (ASX:ISX) is pleased to announce that it has entered into an agreement with financial trading technologies specialist, ayondo. iSignthis Ltd (ASX:ISX) is pleased to announce that it has entered into an agreement with the Cyprus based and regulated online Forex and CFD broker, Leverate Financial Services Ltd. iSignthis will be providing Leverate with their full Paydentity solution including Digital KYC, Strong Customer Authentication, Fraud Prevention and Payment Gateway services. Integration for the multi-year service is set to start immediately with the service expected to be live in the next 3 months. iSignthis Ltd (ASX:ISX) is pleased to announce the expansion of its services within the bitcoin industry via its existing relationship with Coinify ApS who recently announced a new partnership with Blockchain, an industry leader with over 50% market share. iSignthis Ltd (ASX:ISX) is pleased to announce that it has entered into an agreement with UK FCA regulated Valutrades, which offers FX & CFD trading. iSignthis Ltd (ASX:ISX) is pleased to announce the commencement of their &apos;key controller&apos; digital KYC service, with global payments expert, Ixaris. iSignthis has adapted its consumer facing Digital KYC service to verify the natural persons who are the merchant&apos;s key controllers, including Ultimate Beneficial Owners, directors, officers and other stakeholders. iSignthis Ltd (ASX:ISX) is pleased to announce that it has entered into an agreement with the global leaders in online trading, IronFX. iSignthis will be providing IronFX with its full range of Paydentity services, including Digital KYC, Strong Customer Authentication, Fraud Prevention, Payment Gateway and Card Tokenisation. The service is set to go live in the next 3 months. iSignthis Ltd (ASX:ISX) is pleased to provide the business update and Appendix 4C for the quarter ended 30th September 2016.
iSignthis Ltd (ASX:ISX) is pleased to announce that it has granted a licence to Australia&apos;s leading online retailer Kogan.com (ASX:KGN). iSignthis Ltd (ASX:ISX) today announced the Financial Report on the results for the year ended 30 June 2016. In accordance with Listing Rule 4.3A, the report is attached. iSignthis Ltd (ASX:ISX) are pleased to provide the Company&apos;s Presentation at the Canaccord Boston Growth Conference August 10 - 11th 2016. Australia&apos;s only ASX listed RegTech, with payment processing capability, iSignthis automates AML/CTF KYC & transaction monitoring via its payments and identity processing platform for traditional and non traditional businesses. iSignthis Ltd (ASX:ISX) is pleased to announce that it has entered into a Payment Facilitator Program Services Agreement. 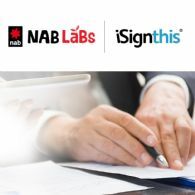 The agreement with National Australia Bank (ASX:NAB) enables iSignthis to use card acquiring services together with its identity, payment processing and authentication solutions. iSignthis Ltd (ASX:ISX) is pleased to announce that it has entered into an agreement with the global payments expert, Ixaris. Ixaris is one of the world&apos;s most flexible and extensible payment technologies, providing businesses with perfect fit payment solutions. iSignthis Ltd (ASX:ISX) is pleased to announce that it has entered into an agreement with online Forex and CFD broker, FxNet Ltd. FxNet Ltd is a global Forex award winning broker which offers online trading services to clients in over 100 countries, including Islamic, Multi-Account Manager and Corporate trading accounts. iSignthis Ltd (ASX:ISX) is pleased to announce that it has entered into a partnership agreement with the world&apos;s leading binary options platform provider, TRADOLOGIC. iSignthis Ltd (ASX:ISX) is pleased to announce that it has entered into an agreement with one of the industry leaders in online Forex and CFD trading, XM.COM. iSignthis Ltd (ASX:ISX) are pleased to provide a Company presentation for the London School of Economics in Cyprus - titled, "Technology Transformation: Breaking ground in the new economic & social environment." iSignthis Ltd (ASX:ISX) has entered into a pilot agreement with the industry leader in online trading, iFOREX. iSignthis will integrate with iFOREX to pilot and optimize the ISX Digital KYC service. A successfully optimized pilot will provide iFOREX with a user friendly onboarding system. iSignthis Ltd&apos;s (ASX:ISX) &apos;paydentity&apos; solution delivers payments with an automated digital KYC. iSignthis is the global leader in dynamic, digital AML/CFT KYC identity proofing. Our Paydentity solution incorporates real time electronic verification to converge electronic payments with remote KYC identification. iSignthis Ltd (ASX:ISX) is pleased to provide the following business update and Appendix 4C for the quarter ended 31st March 2016.
iSignthis Ltd (ASX:ISX) are pleased to provide an analyst brief presented at Hong Kong - April 2016.
iSignthis Ltd (ASX:ISX) has received executed access agreements, and also finalised and tested its technical integration with Yeepay, and its subsidiary the Beijing Yi HuiJin Information Service Co. Ltd. The strategic partnership between fintech industry&apos;s innovative KYC compliance service provider, iSignthis Ltd (ASX:ISX), and the leading blockchain payments provider, Coinify ApS, delivers service commencement of a new global product connecting blockchain payments, KYC identity & credit cards. iSignthis Ltd (ASX:ISX) (&apos;the Company") is pleased to announce that it has achieved Level 1 Payment Card Industry (PCI) Data Security Standard (DSS) v3.1 certification for its V2.0 SaaS &apos;paydentity&apos; cloud based identity and payment processing services. Should we rely on historical fraud data and &apos;after the fact&apos; vendor alerts - what&apos;s the alternative - what can we add? How do merchants prevent fraud at customer on-board and ongoing? iSignthis Ltd (ASX:ISX) are firmly focussed on the gaming and trading market with little or no impediment (regulatory and legal) standing in our way to complete new deals and to grow the business. iSignthis Ltd (ASX:ISX) is the global leader in dynamic, digital, automated AML/CTF KYC identity proofing. We use real time electronic verification of regulated payment instruments to generate an up to the moment identity profile for any of the world&apos;s 3.5Bn financially included persons, no matter where they are located. iSignthis Ltd (the "Company") (ASX:ISX) today announced the Financial Report on the results for the half year ended 31 December 2015. In accordance with Listing Rule 4.2A. iSignthis Ltd (ASX:ISX) is pleased to announce that the Company&apos;s remote Know Your Customer (KYC) service, paydentity, is suitable for use by businesses in the regulated sector of the Isle of Man (IoM), including betting / eGaming operators and financial services. iSignthis Ltd (ASX:ISX) is pleased to announce that it has entered into an agreement with Hong Kong based online payment gateway service provider, IPGPAY Limited ("IPGPAY").